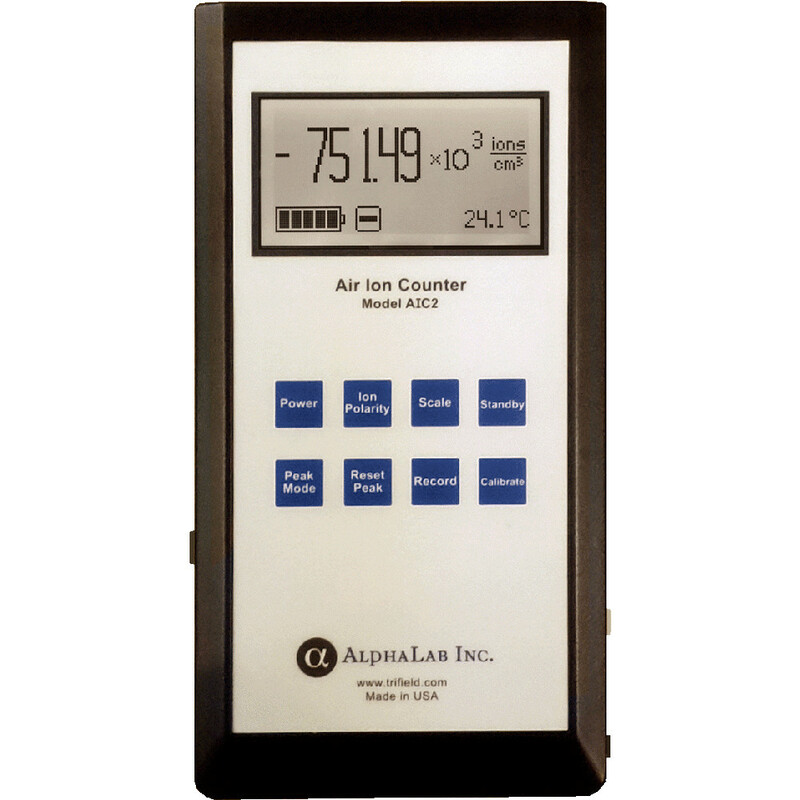 Air Ion Counter Model AIC2 - AlphaLab, Inc. 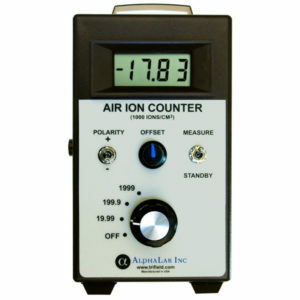 The Air Ion Counter Model AIC2 is a handheld meter designed to measure ion density– the number of ions per cubic centimeter (ions/cc) in air. It measures this number separately for positive and negative ions (+ and – ions are usually present simultaneously). This instrument is a true ion density meter, based on a Gerdien Tube Condenser design, and it contains a fan which draws air through the meter at a calibrated rate. The meter features dual scales of 2 million and 200 million ions/cc. For comparison, a typical outdoor environment has 100 to 1000 ions/cc, both + and -. The 200 million ions/cc range is suitable for measuring close to electric ionizers or strong radioactive sources. The USB Port in conjunction with AlphaApp provides real time ion level data and plotting as well as the ability to upload and plot recorded ion levels. Recording of an ion level can be initiated manually by the user or automatically at intervals of a half a second to 120 seconds. At a 5 second interval, up to 420 hours if data may be stored in the meter nonvolatile memory. See AIC2 instructions for more details. Air is drawn in at the top of the meter, measured, and exits at the bottom. The display shows the ion count within 1 second and it continues to display the ion density in the air, showing any changes within 1 second after they occur. The POLARITY selection determines whether + or – ion density is measured. The meter operates on four AA batteries or an external 6V to 9VDC supply. See AIC2 instructions for more details.Please note: solids do not produce ions unless there is an energy source (such as radioactivity, high voltage or heat above about 600° C). For example, neither tourmaline nor “diodes” produce any ions at room temperature unless radioactive material has been added. However, liquids evaporating can produce ions.